Those two words once brought joy to my heart. In households across the land, grown men daydreamed of days astream, and wives wished that trout season had never been invented. Today most trout fisheries are open to year around angling, and the ritual of opening day has been relegated to the memories of those of us who experienced it. In Michigan, where I misspent most of my youth, it opened the third Saturday in the month of April. All the good trout streams were located in the northern part of the state, and in the north country at the end of April, winter was never very far away. This resulted in the faithful expressing much concern about the conditions that they might encounter when they struck out for their favorite trout stream. As the fateful day approached all eyes were keenly focused on the long range weather forecast, and reports from the north country were eagerly sought out. The amount of snow was of great concern. If there was lots of snow, then a quick warming trend could make the streams unfishable, and turn the back roads into impassable mud holes. Too much snow could mean that the back roads and campgrounds would still be closed, making access difficult, if not impossible. If it had been unusually warm, the early hatches might be finished before the season opened. It was clear that opening day was fraught with uncertainty. One thing was certain, that come hell or high water, the faithful addicts would be there. More often than not, that is exactly what we found, at least the high water part. Opening day was akin to young love, filled with promise, but permeated with uncertainty. 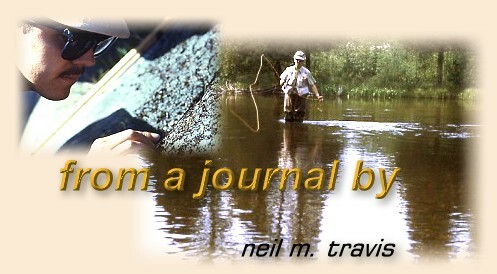 The streams were usually too high and too cold for good fly fishing, unless your bent was towards nymph fishing. The hatches, when they were present, were customarily sparse and elicited little interest on the part of the trout. Sometimes the weather was delightful, but on more occasions than I care to remember it was abysmal. In retrospect, opening day was never about fishing, although no one would ever admit it. The faithful knew that opening day was a ritual, a time of renewal and revival. Opening day reassured us that things were as they should be, that God was in His heaven, and that all was right with the world. We knew that fishing would be better in the coming weeks, but for now it was enough to feel the water flowing around one's waders, to smell the damp earth, and to renew that essential contract between one's self and his environment. Opening day was about renewing old friendships forged through the years along trout streams. It was a time to rejoice with those who returned, and to lament over those whose angling days were over. Opening day was a celebration of life as the Creator intended it to be lived, a new beginning, the start of yet another voyage upon the uncharted sea of life's experiences. Opening day assured us that there was a degree of normalcy in a world where change and the status quo were constantly in conflict. Like a comfortable old hat, opening day felt good, it fit and gave meaning to life.